Let’s see, Belle Époque setting… check. Clockwork android created by boy’s mad scientist father… check. Boy is an orphan hiding in a Parisian clock tower… check. Yes, Martin Scorsese does clockpunk. 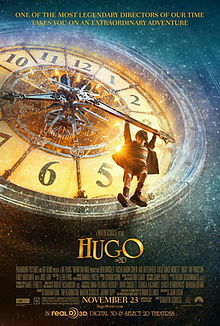 Hugo is Martin Scorsese’s 3D movie based on Brian Selznick’s novel ‘The Invention of Hugo Cabret’. Stars are in abundance, as you would expect with a chance to appear in a Scorsese flick… Asa Butterfield, Chloë Grace Moretz, Ben Kingsley, Sacha Baron Cohen, Ray Winstone, Emily Mortimer and Jude Law. It’s this year’s Christmas film of choice to take the kids to!